Mary Cadogan suggests some simple but delicious ways to enjoy the offerings of summer. One of the highlights of every cook's year is the arrival of the first English strawberries of the season. It's not just their sensational flavour and luscious texture that gets our tastebuds tingling - it's the memories of summers past. Once these gorgeous berries arrive, we know that summer is truly here. We can put away our cardigans, dust off the garden furniture and look forward to long, hot days gorging on summer berries. And, as we become increasingly able to buy once-seasonal produce all year round, it's even more of a treat to enjoy the distinctive juicy freshness of Britain's home-grown summer fruits. Eating the first of the fresh raspberries straight from the punnet, setting out a big bowl of cherries for the children to stain their mouths with, and whizzing up milkshakes with the late summer glut are all wonderful pleasures. And when you tire of eating these glorious fruits as nature intended, you can try whipping up this simple but mouth-watering recipe to enjoy with family and friends. 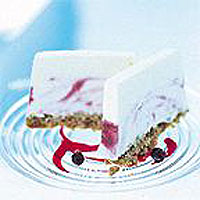 Semifreddo means semi-frozen in Italian - literally, an ice cream that's softened before serving, bringing out more of the flavour. You don't need an ice cream maker, and it's frozen in a loaf tin so it can be cut into slices. Traditionally it's made with a base of home-made custard, but ready-made custard can give you a great flavour for much less work. This dessert can be frozen for up to three months - wrap in freezer film, then overwrap in foil. Freeze the sauce separately. Line a 1kg loaf tin with a strip of baking parchment that covers the base and reaches up the long sides. Place blackcurrants in a small pan with half the sugar and the water. Bring to the boil, then simmer for 5 minutes until the fruit is softened. Pass the currants through a sieve, pressing out as much of the pulp as you can. Divide into two equal portions and leave to cool. Place the biscuits in a strong food bag. Crush with a rolling pin to make crumbs. Mix with the melted butter. Lightly beat the mascarpone in a large bowl until soft. Beat in the custard, a little at a time, until smooth. Then stir in the remaining sugar and the vanilla extract. Using one portion of blackcurrant sauce, drizzle a little over the base of the lined tin. Spoon half the cheesecake mixture over the top, then a little more sauce. Add the remaining mascarpone, then drizzle the rest of sauce over the top. Swirl the mixtures together with a skewer or chopstick, then smooth the top. Sprinkle the buttery crumbs evenly over the cheesecake, then press lightly to firm. Cover tightly with freezer film or foil, and freeze until firm - at least 4 hours, or overnight. Freeze the remaining blackcurrant sauce separately if you're not planning to serve it straight away. To serve, transfer the cheesecake to the fridge for 1 hour until slightly softened. Turn out onto a serving plate and peel off the lining paper. Cut into slices and serve with the reserved sauce drizzled over the top.